Enveloped, spherical. Diameter from about 42nm. Icosahedric capsid with a T=4 symmetry. Partially dsDNA circular genome, about 3.2 kb in size. Encodes for 7 proteins. The minichromosome is transcribed by cellular RNA polymerase II under the control of four promoters (the core, pre-S1, pre-S2/S, and X promoters) and two enhancer regions (ENH1 and ENH2). The early transcript encodes HBx, all others are late transcripts. The pre-genomic RNA is alternatively spliced. The unspliced form is exported from the nucleus through a PRE motif possibly by capsid protein. The Polymerase and short S proteins are expressed by leaky scanning from the pg mRNA and the S mRNA respectively. 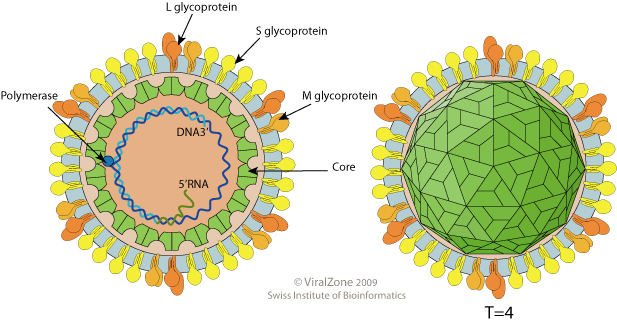 Virus attaches to host receptors through major surface antigen and enters the cell by an unknown mechanism. Relaxed circular DNA (RC-DNA) and capsid are transported via microtubules to the nucleus where DNA is released through the nuclear pore, and repaired to form covalently closed circular DNA (cccDNA). 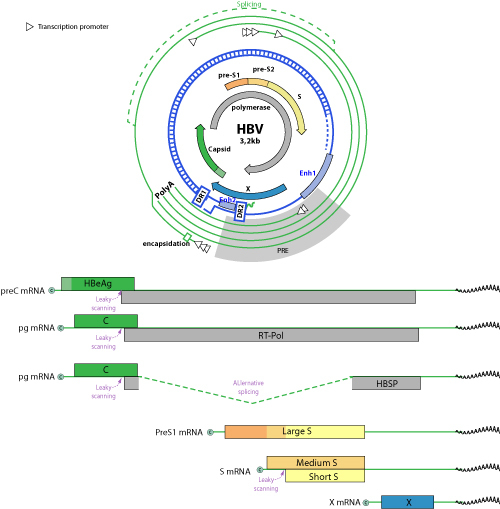 Transcription by RNA polymerase II of the viral mRNAs and the pregenomic RNA (pgRNA). The unspliced pregenomic RNA leaves the nucleus by nuclear pore export. In the cytoplasm pgRNA is encapsidated, together with the P protein, and reverse-transcribed inside the nucleocapsid in new RC-DNA. Transport to the nucleus of new RC-DNA leads to cccDNA amplification; alternatively, the RC-DNA containing nucleocapsids are enveloped at the ER, and new virions are released by exocytosis. HBV L surface protein Binds to SLC10A1/NTCP in order to enter hepatocytes. HBx seems to be able to increase autophagy through the up-regulation of host beclin 1 expression . HBx protein deregulates cell cycle checkpoint controls at G0/G1 and G2/M . HBx directly interacts with and inhibits host MAVS protein by inducing its ubiquitination and targeting it for degradation .